– New! Full support for windows 10. – New! Full support 512Byte/1K/2K/4K sector size. – New! Added splash screen, more friendly interface. – New! Added portable edition for windows, automatically save log files to desktop. 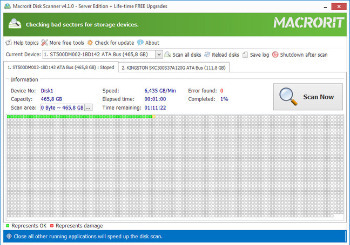 – Support to check and scan whole disk, partition, free space. – Support to automatically shut down computer while finish scanning. – Scan result will be automatically saved in the specified location. – Scan disk with super-fast speed. – Mark healthy sectors in green and errors in red. – Small portable tool, 100% clean, safe, no spyware, no adware, no virus. – Force to shut down or stop scanning process is supported. NO harm for computer.